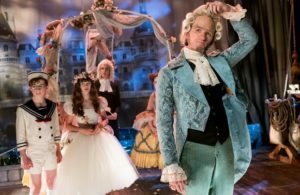 The first two episodes of A Series of Unfortunate Events cover the events of the first book, The Bad Beginning, starting with the catastrophe that sets the whole miserable chain of events in motion. The three Baudelaire children, Violet, Klaus, and Sunny, learn that their parents have just perished in a terrible fire, and now that they are orphans, they will be sent to live with some obscure relative. 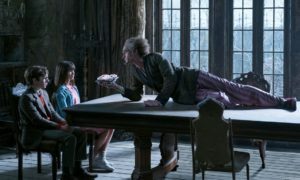 Their first guardian turns out to be the nefarious Count Olaf (played with manic energy and flamboyance by Neil Patrick Harris), who is hellbent on getting his hands on the Baudelaires’ great fortune. He proves to be the worst guardian imaginable, making the children do horrible chores and providing terrible living conditions. He mocks them constantly and continuously plots to ruin their lives even further. Fortunately, the three Baudelaires are intelligent and resourceful and they manage to endure the worst ordeals with courage and conviction. They use their talents to not only finish all the nasty chores Count Olaf forces them to do, but to eventually outsmart him when he tries to marry Violet so that he can acquire their fortune. Through Violet’s inventing skills, Klaus’ reading and research skills, and Sunny’s biting skills, the three children are able to save themselves from a terrible fate. And they are going to need to depend on themselves for the many trials to come because as these first couple of episodes of A Series of Unfortunate Events prove, the adults around them are either too evil or too incompetent to be able to help them. Other than Count Olaf and his group of henchmen (and women), the other adults such as Justice Strauss and Mr. Poe are well-meaning but clueless, unable to see the danger the children are thrown in until it is too late. A Series of Unfortunate Events is a pretty much perfect adaptation of the books it is based on, because enough time is devoted to properly do justice to the events of each book. The imagery is vivid, stylized, and very Burton-esque and the cast give very strong performances. And, of course, it helps that the episodes are written by Daniel Handler (Lemony Snicket himself). 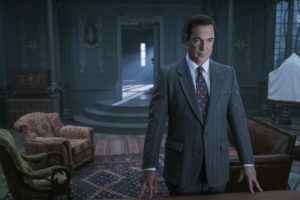 The character of Lemony Snicket (played by Patrick Warburton) also adds to the charm of the series by breaking the fourth wall (as he did in the books) since he occasionally pops into the narrative to explain some aspects of the story, give some amusing vocabulary lessons, and to persistently warn the viewers to look away from A Series of Unfortunate Events unfolding before them. The added screen time also allows for some aspects of the story to be extended or explored deeper, so there are a number of scenes and characters that didn’t show up in the books but still add to the mystery of the story. And considering that the author is behind these changes, they might as well be considered canon. I won’t go into too many spoilers but even in this first season we see more of the activities of the VFD, when their existence was only hinted at in the later books. There is also that intriguing scene at the end of the episode that may change the course of the entire series and is a major departure from the books (or at least that’s how it seems right now, but nothing is ever as it seems in this story.) We see the Baudelaire parents alive and well and trying to get back to their children. I am really looking forward to how this scenario plays out for the rest of the season.